Gather round, ladies. We want to tell you a story. A story of last-minute dates, squeezing in one too many episodes before getting ready to go out, and of the noble struggle of washing your hair less frequently to slow the greasing process. Dry shampoo has come a long way since the days of hanging upside down and applying talcum powder to your roots. If you don’t already use the stuff, we’re here to convince you to change your ways. And, if you already do, we’re about to blow your game right out of the water with something that’s just hit our shelves. 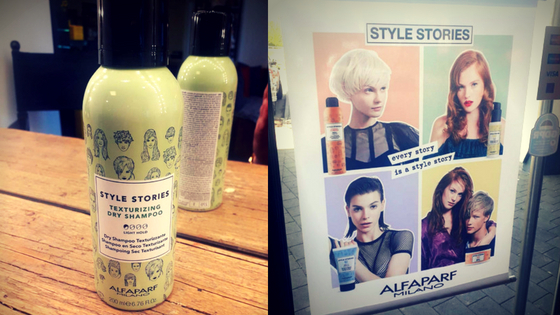 Introducing another amazing product line by Alfaparf Milano that we’re packing at the House of Style, Style Stories. More specifically, we want to talk about their texturising dry shampoo that has us pushing our washing cycle out juuust one more day. This one flies off the shelves if we’re honest. It’s a spray that gives your hair volume, and, get this; it removes residue from previous styling products you’ve used but provides a light hold to your hair, so pretty much resets your style. We know we say this a lot, but, you wouldn’t believe how good it smells. Next time you pop in for a cut, colour or style, go ahead and ask for a little smell of the texturising dry shampoo, or more information about the line. The packaging is just gorgeous!